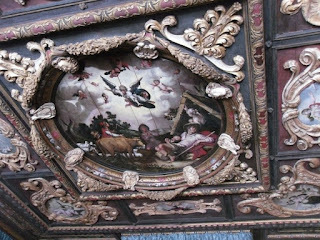 A guest post by Brittani. 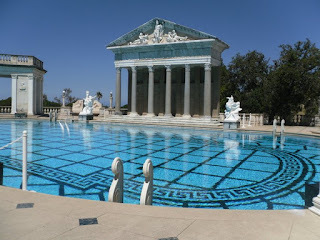 Hearst Castle is located in San Simeon, California, and is a National Historic Landmark and California Historical Landmark. It has recently been in the news here in the United States due to its forced closure for a time at the end of August due to a raging wildfire in the area. Hearst Castle sits on more than 250,000 acres in San Luis Obispo County, roughly half-way between Los Angeles and San Francisco. 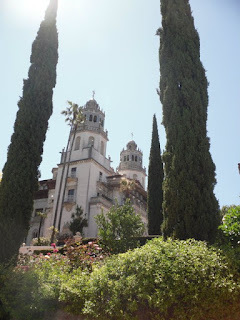 In 1865, George Hearst - more on the Hearst family later - purchased 40,000 acres of land. 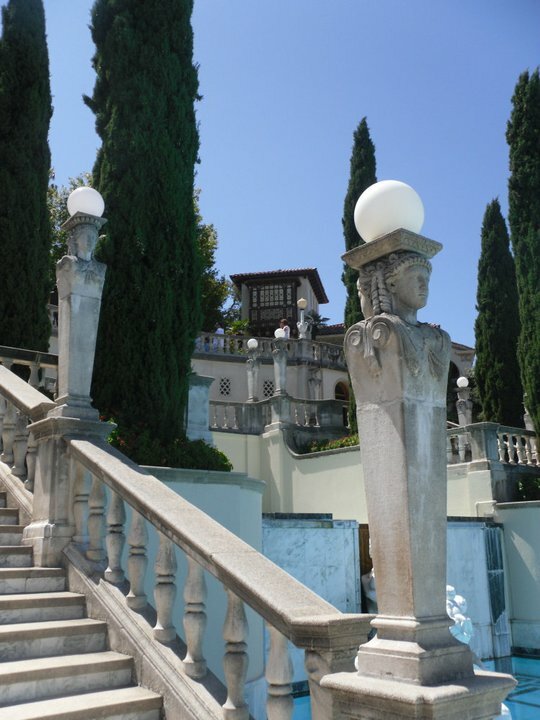 By 1919, William Randolph Hearst had inherited the land from his father. Over the years, the 40,000 acres purchased by his father had grown to over 250,000 acres. 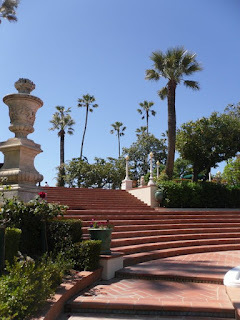 William wanted to create a retreat called La Cuesta Encantada (Enchanted Hill in English). 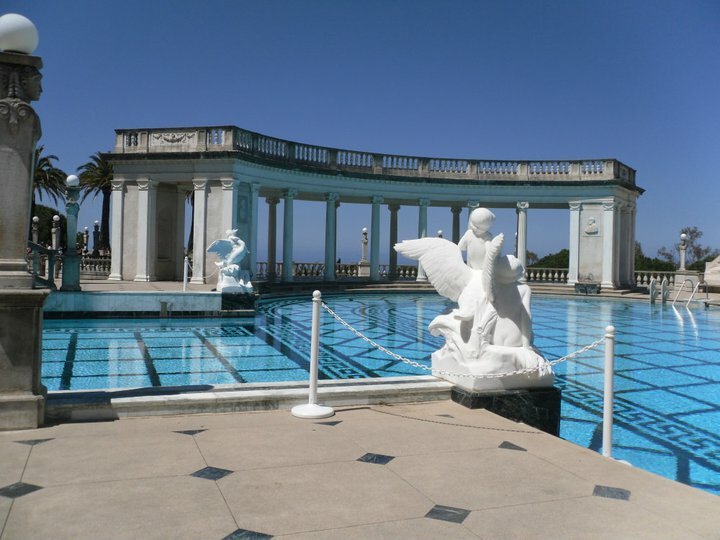 Its location is off of Cabrillo Highway, which is also sometimes famously called Pacific Coast Highway. 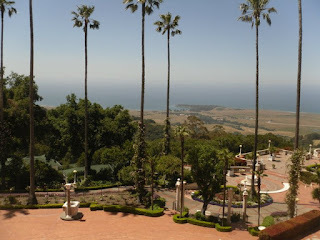 From many spots on the property, you can look out and see the Pacific Ocean. Hearst got in contact with an architect by the name of Julia Morgan, who helped create the castle we know today. Construction workers broke ground in 1919, but it would not be completed until 1947. The architecture was themed after Renaissance and Baroque styles in southern Spain. Hearst had a personal airport and zoo put on the property, as well. Hollywood and political elites were known to be frequent visitors. 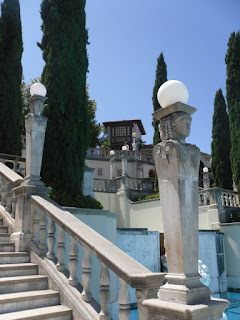 During the 1920s and 1930s, Hearst Castle was the place to be! Visitors included Bob Hope, Clark Gable, Winston Churchill, and President Franklin D. Roosevelt. 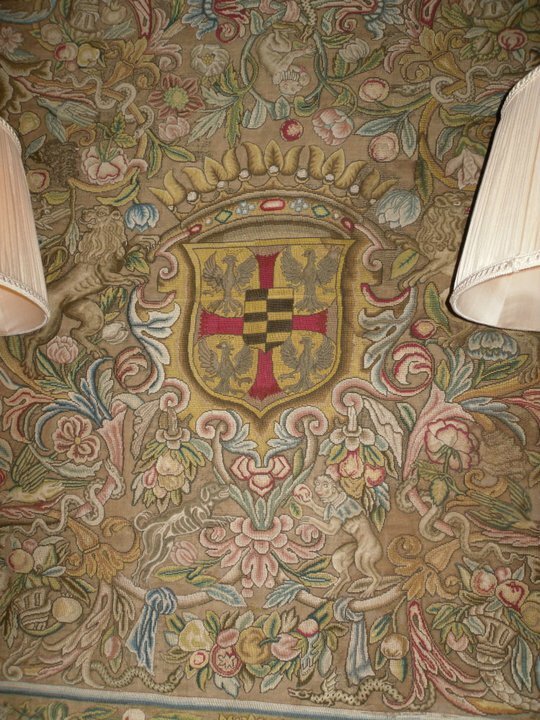 I was lucky enough to visit this beautiful castle a couple of years ago, and it did not disappoint. At the time, I was an undergraduate at the University of Tennessee majoring in history and political science. 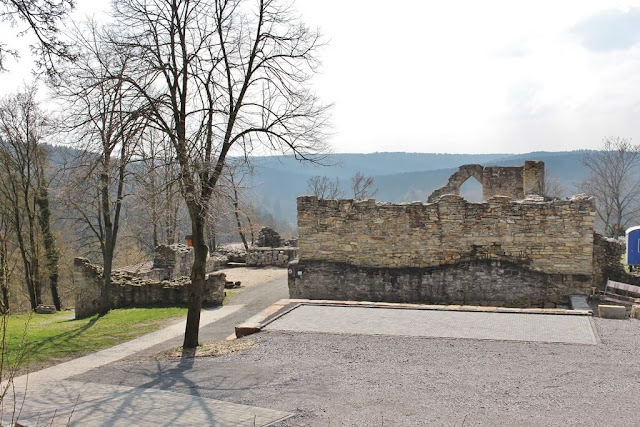 Getting the chance to visit this castle was a history lover’s dream! 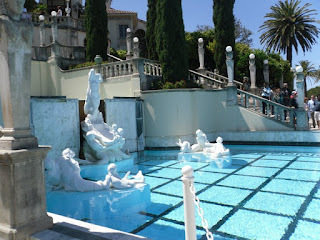 My favorite area of Hearst Castle was the outdoor pool called Neptune Pool, which took eight years to build. 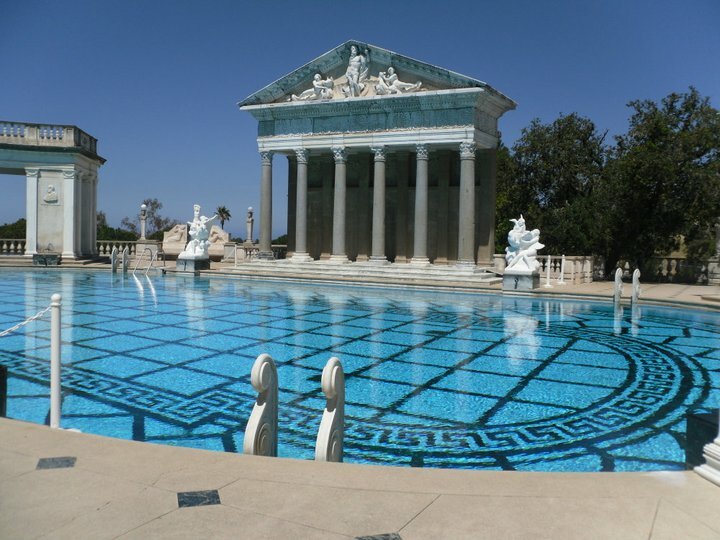 Vermont marble was used for the pool and columns. 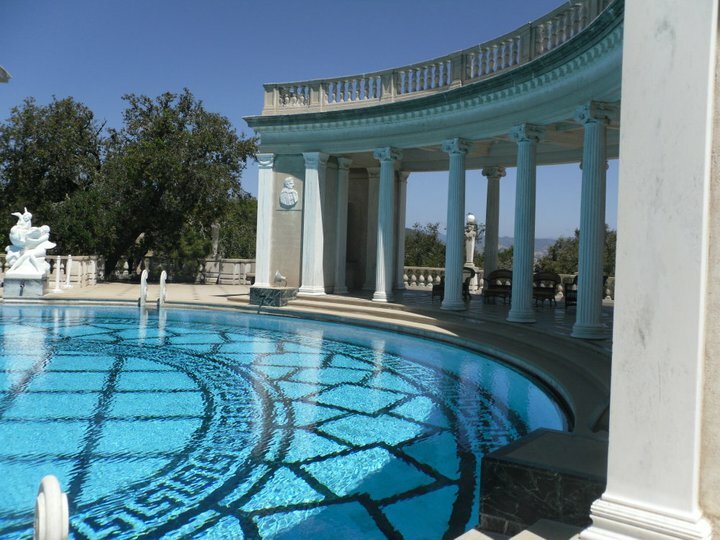 As you can see from the pictures, the ancient Roman-themed pool is absolutely gorgeous! 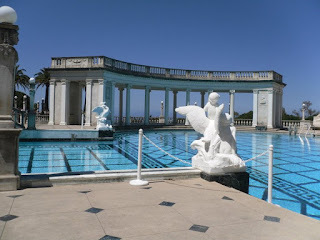 However, if you make the trip to Hearst Castle, you will see Neptune Pool completely drained, as it is going under refurbishments for the time being. 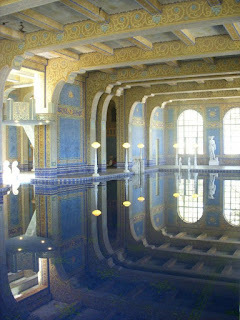 The indoor pool called the Roman Pool of the castle was beautiful, as well. What I loved about this area was the fact that it had eight different statues of Roman gods and goddesses. The design of this pool was based on the ancient Roman baths. 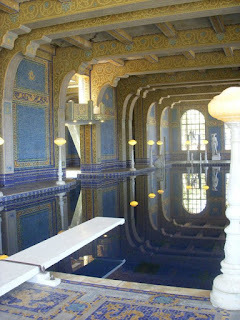 During the tour, we were told that they believe the pool was designed to mirror the Baths of Caracalla in Rome. You can see the color of the pool through the photos below. If you think that it looks like real gold, you would be right! 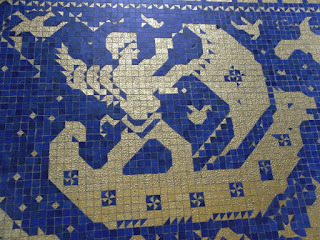 Certain tiles were clear with gold fused inside! Throughout the castle, there was breathtaking artwork from the ceilings to the vases on the tables. 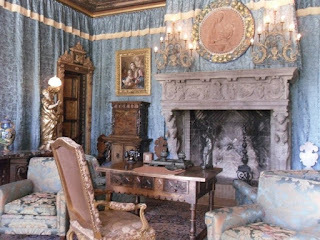 One part of Hearst Castle that I found unique was one piece of art hanging on the wall. 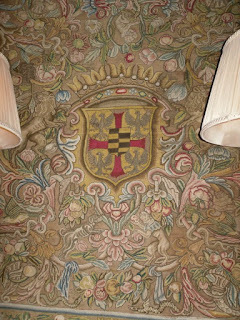 The Gonzaga Family Crest hung on one of the walls of a sitting room. 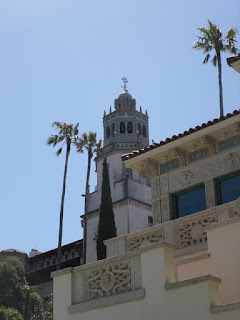 The reason for this was that the Hearst family has been donors for years to the university, and William Randolph Hearst has a scholarship in his name at Gonzaga. If you aren’t from the United States, you might be unfamiliar with the Hearst name. William Randolph Hearst, a Harvard graduate, built the largest newspaper chain in the United States. Many claim that he has been one of the biggest influencers in modern journalism. He was also a member of the United States House of Representatives, representing New York, from 1903-1907. His son, William Randolph Hearst, Jr. became a Pulitzer Prize-winning journalist years later. All of William Senior’s children obtained some sort of post-graduate education. 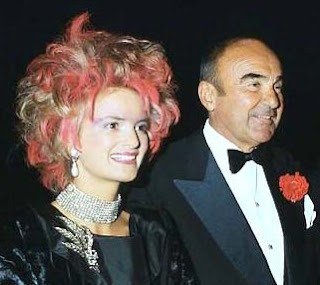 One of the most well-known members of the Hearst family is Patty Hearst - the granddaughter of William Randolph Hearst. While she was a student at the University of California, Berkeley, Patty was abducted by a left-wing terrorist organization called the Symbionese Liberation Army (SLA) in 1974. The SLA was pro-communism, pro-feminism, and New Left organization that operated in California. The group wanted to hold Hearst hostage until her family agreed to give $70 worth of food to each needy Californian. Patty’s father immediately donated $2 million, after taking out a loan, to the poor in the San Francisco Bay area, but the SLA deemed it not enough. Hearst was blindfolded and kept in a closet, according to her testimony. She then decided to join their cause after being told her options: Be killed or join forces. Patty was trained with weapons and ideology and repeatedly raped by her captors. Two months after she was taken hostage, the SLA released an audiotape of her confessing that she had joined their ranks, and she claimed that she was using the name “Tania”. She would go on to participate in different bank robberies in California and become a fugitive on the run. In August of 1975, she helped to create explosives that were unsuccessful in killing policemen. Patty was finally arrested in September 1975. Her attorneys used brainwashing and forced intoxication as her defense. They also argued that she acted in fear, knowing if she made the wrong move she would be killed. On March 20, 1976, she was convicted of armed robbery. The judge only gave her a seven-year prison sentence. President Jimmy Carter commuted her sentence, and she was freed eight months before her parole hearing. She had strict restrictions and was on probation. On President Clinton’s last day in office in 2001, he granted Patty a pardon. Hearst Castle is open at 9am PST daily, apart from Thanksgiving Day, Christmas Day, and New Years Day. Ticket prices start at $25 for adults and $12 for children between the ages of 5 and 12. Those under 5 get in free! There are handicapped accessible tours available, as well. For more information, have a look here - and there's also an app available. Brittani is from Tennessee, USA. She is a political scientist and historian after graduating with a degree in the topics at the University of Tennessee, Knoxville, in December 2014. She's currently pursuing a master's degree. She enjoys reading and researching all things regarding the royals of the world. Her love of royals began in middle school, and she's been researching, reading, and writing on royalty for over a decade. She has been the Europe Correspondent for Royal Central since June 2016. 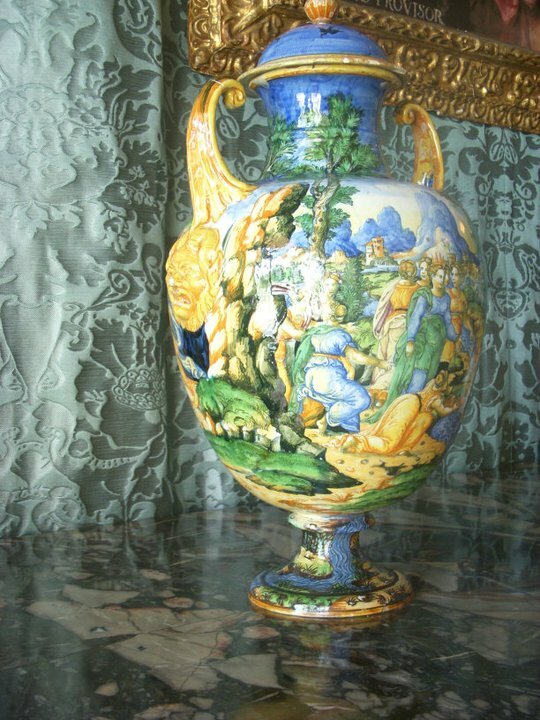 She is a contributor for History of Royal Women, as well. 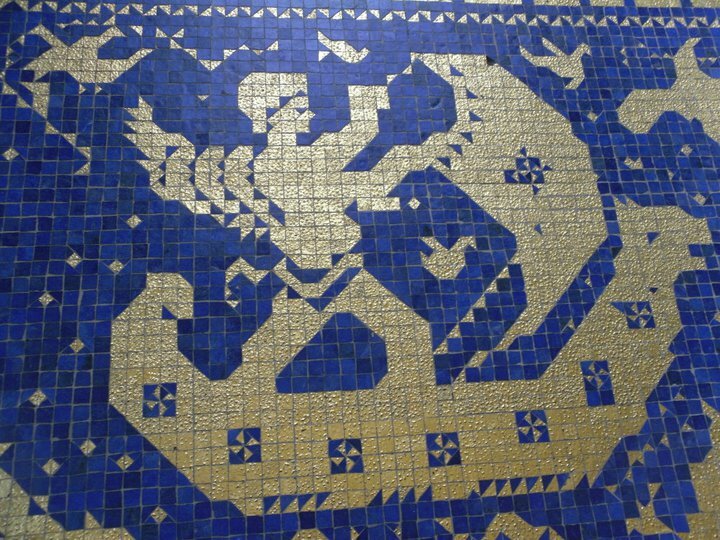 You can find her Royal Central articles here. Questions or concerns, don't be afraid to get in touch. You can follow her on Twitter at @brittani_91.